FLORENCE SHIH FU-LIEN LING Florence Shih Fu-lien Ling died on Feb. 8, 2018 in Portland, OR. She was born (July 22, 1924) in Shanghai, where she graduated from St. John's University. After a whirlwind courtship, she married Louis Yat Ling, a U.S. soldier stationed there. They honeymooned on the USS President Cleveland, sailing to Honolulu in 1948. There, they raised six children and prospered. 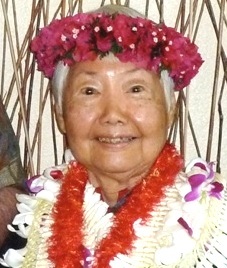 After 1991, when Florence retired as a teller at First Hawaiian Bank, she went on to enjoy 27 years of friends, dancing, mahjong parties, travel and visits from her family, both in the U.S. and China. Louis Ling died in 1996. Florence is survived by her children Flora Ling, Christina Ling, Diane Campbell, Arthur Ling, Emily DeVall, Bernette Lerman, 12 grandchildren and five great grandchildren, and her favorite nephew Shih Jia. A celebration of life will be held at Hawaiian Memorial Park (to be announced).